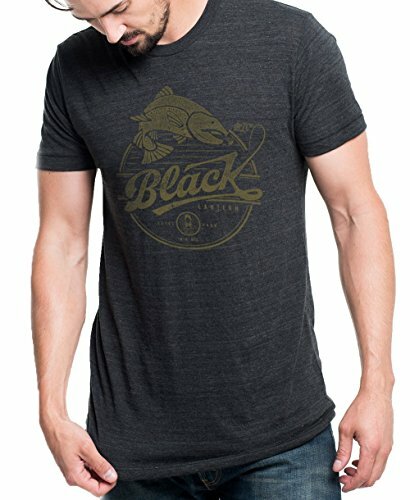 This men's tri-blend t-shirt features a super soft screen print of our mountain manufacturing retro trout logo! The distressed and retro styled art blends perfectly with this blended fabric tee. A great shirt for any fisherman. Burnt Ochre Ink on USA Made Men's Tri-Blend T-Shirt | Tri-Black | All our inks contain no metals, or harsh chemicals. - 3.7 oz. - 50% polyester, 25% ring-spun cotton, 25% rayon - Vintage Styled Tri-Blend T-Shirt - Durable rib neckband - Hand printed in Estes Park, CO. If you have any questions about this product by Black Lantern, contact us by completing and submitting the form below. If you are looking for a specif part number, please include it with your message.